Editorial: Should BMW Build a Serious Off-Roader? Home / Interesting / Featured Posts / Editorial: Should BMW Build a Serious Off-Roader? It’s a question that’s crossed our minds, and it may have crossed BMW’s board room tables. Should BMW build a serious off-roader? What defines a serious off-roader to begin with? What are the potential benefits of building one, and who would buy it? All of these are relevant questions. To start off, a serious off-roader would be defined by BMWBLOG as an off-road vehicle that features full-time 4-wheel-drive with locking front, mid, and rear differentials. The vehicle should also have unlocking sway bars, plenty of ground clearance (preferably over 14″ or 44 cm), steep approach, departure and break-over angles, and lower gear ratios at the ready, preferably on the fly. A factory equipped winch would be nice, as would a air snorkel, mounted at least side-view mirror height. A fire-hose washable interior would also be nice, particularly if an open top version is offered. Easy reach tow-hooks front and rear would be nice, as would massive, thick-gauge skid plates covering the belly of the beast. Finally, diesel power would be preferred, preferably a torquey, highly efficient unit to extend range. That’s quite a wish list, we admit. But for those who take off-roading seriously as a hobby, or for those who depend on off-road vehicles for their line of work or service to their respective militaries, this wish list is just the beginning. The most off-road worthy vehicle BMW currently offers is the X5, and while it can handle slippery roads in stride – it does not belong on the punishing Rubicon trail – nor does it belong in the Outback, or deep in the African or South American jungle. The potential benefits of building a focused BMW off-roader would include market share in the hotly contested military and security vehicle segment. Mercedes has built over 200,000 G-wagons since 1979, and in fact, the G-wagon is Mercedes’ longest standing model in the lineup, and hence, one of its most successful and profitable. Another niche could be claimed by BMW if they don’t hold their engineers back – BMW does seem to be smitten with filling every niche these days… don’t they? A harder line could be brought to BMW’s marketing partners, thus allowing ads to place this vehicle squarely against the likes of Land Rover, Mercedes, Jeep, Hummer (the original, not the annoying and useless GM-based wannabe version) and Toyota offerings. 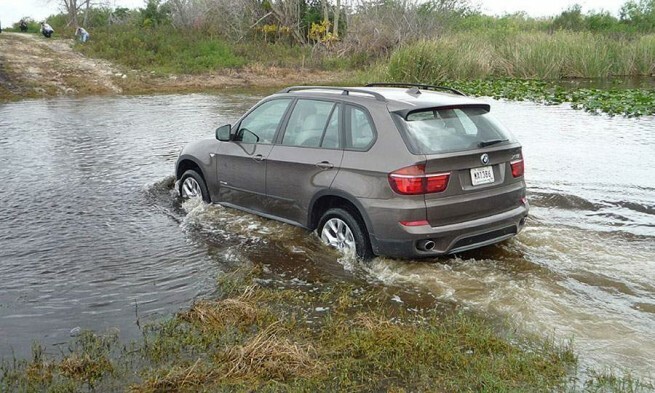 The BMW off-roader, let’s call it the BMW X, could be offered in both military and civilian versions. While it’s true that most buyers would not take their civilian X much further off-road than a gravel driveway, this is hardly the point, nor is it an argument against building it. The marketing value and military/security sales alone would validate its existence. We have no concept sketches of such a vehicle. Anyone out there interested in forwarding their effort? We’ll post all sketches on the website, linked back to this article. If BMW did decide to build the X, it would come with a premium price tag, what with its bespoke, one-off engineering and high-quality, durable parts. Testing alone would rack up the price tag. But rest assured that with BMW’s security vehicle experience and engineering prowess, along with their diesel expertise, they could take the fight to the competition on both the road ways and the battlefield. When will America be ready for diesels? Rowing Gears: Can Heritage Hurt A Brand?